Designed to make everyday cathing easier! The new SpeediCath® Flex Coudé Pro is designed for difficult male anatomies to make cathing easier for coudé users. One of the main values at Coloplast is closeness…to better understand. By building relationships and listening to our consumers we’re able to better understand their needs, and respond by finding new ways to do things better together. We designed SpeediCath® Flex Coudé Pro to give catheter users a safe and easy-to-use solution that fits into everyday life. The flexible catheter has a fixed curved tip which can bend to follow the curves of the urethra. The soft bead at the end of the tip guides the catheter for easy insertion and the dry-sleeve can be gripped and handled allowing for hygienic insertion of the catheter without touching the catheter tube. Fill out the form below or call us at 1-800-795-5492 to be among the first to try the NEW SpeediCath Flex Coudé Pro! We require verification of a valid coudé prescription (HCPCS code A4352) before we can send samples of SpeediCath® Flex Coudé Pro. If you currently do not have a coudé prescription (HCPCS code A4352) you should talk to your doctor about whether the new SpeediCath® Flex Coudé Pro is right for you. The soft-squeeze grip makes it easy to guide the tip into the urethra safely without touching it. The dry-sleeve means the catheter can be inserted without having to touch the tube itself. The flexible catheter has a fixed curved tip which can bend to follow the curves of the urethra. The soft bead at the end of the tip guides the catheter for easy insertion. For neat, discreet and hygienic handling and disposal, SpeediCath Flex Coudé Pro is re-closable and features non-medical packaging. The newest member of the award winning range of SpeediCath® catheters for men. 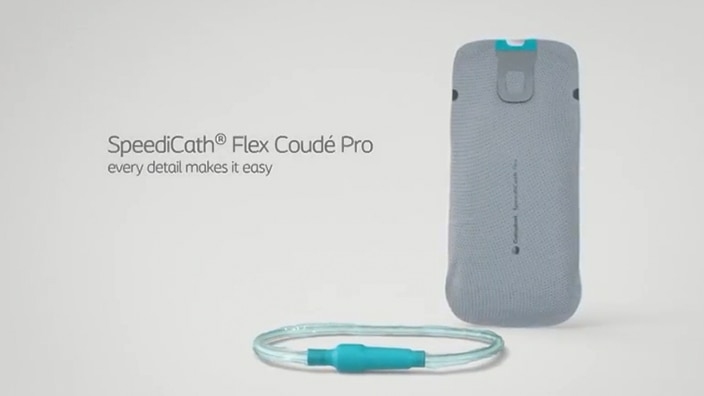 SpeediCath® Flex Coudé Pro is designed to make every step of catheterization easy. SpeediCath® Flex Coudé Pro is indicated for use by patients with urine retention and patients with a post void residual volume (PVR) due to neurogenic and non-neurogenic voiding dysfunction. The catheter is inserted into the urethra to reach the bladder allowing urine to drain. The product is for male patients only. SpeediCath catheters are available by prescription only. Patients performing self-catheterization should follow the advice of, and direct questions about use of the product to, their medical professional. Before using the device, carefully read the product labels and information accompanying the device including the instructions for use which contain additional safety information. The SpeediCath product is for single-use only; discard it after use. If you experience symptoms of a urinary tract infection, or are unable to pass the catheter into the bladder, contact your healthcare professional. The risk information provided here is not comprehensive. To learn more, talk to your healthcare provider. For further information, call Coloplast Corp. at 1-866-226-6362 and/or consult the company website at www.coloplast.us.